Lots of birthday smiles on their special day! This will certainly brighten their day! 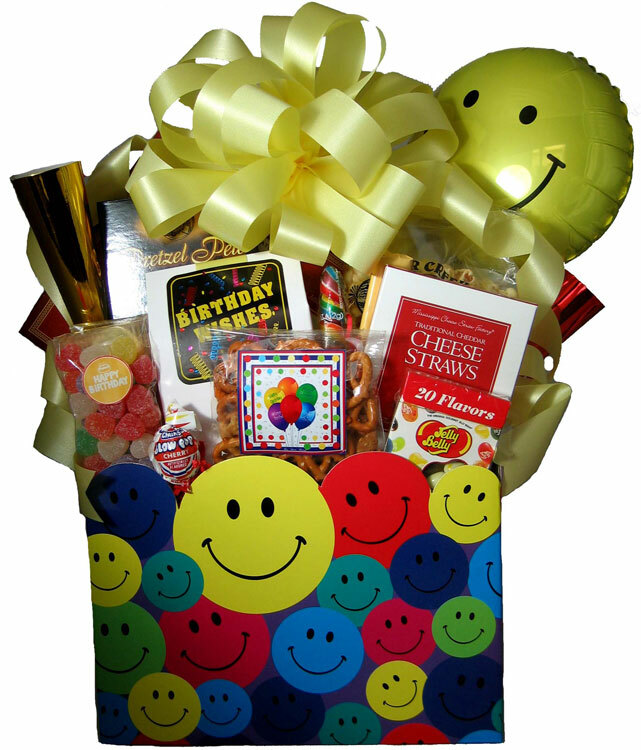 This smiley face container is is filled full with Spiced Gum Drops, "Birthday Wishes" Raspberry filled Shortbread Cookies, "Happy Birthday" Snack Mix, Jelly Belly Jelly Beans, Nuts, Metallic Party Horn, Toblerone Chocolate Bar, Spiral Multi-Color Lollipop, Cheese Straws, Pound Cake, Pretzel Nuggets (Honey Mustard or Garlic & Cheese) or Pretzel Twists (Salted Caramel, Smoky Barbeque, or Cheese Pizza), Gourmet Popcorn (Dark Chocolate with Sea Salt Crunch, Almond Pecan Crunch, Cranberry Walnut Crunch, or Caramel & Jalapeno Cheddar Crunch), and Chocolate filled Butter Wafer Cookies. Wrapped in Crisp Clear Cellophane and topped off with a beautiful smiley face print Cellophane Fan and a colorful Handmade Bow. Includes a Handwritten Enclosure Card. The party is on! Finished design is approximately 20"h x 12"w x 9"deep. Container size is 10 1/4" x 6" x 7 1/2". 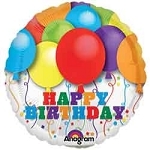 Add Balloons for $2 each (the balloon in the photo is an add on).